Let us, then, meditate upon the Nativity just as we see it happening in our own babies. I would not have you contemplate the deity of Christ, the majesty of Christ, but rather his flesh. Look upon the Baby Jesus. Divinity may terrify man. Inexpressible majesty will crush him. That is why Christ took on our humanity, save for sin, that he should not terrify us but rather that with love and favor he should console and confirm. Behold Christ lying in the lap of his young mother, still a virgin. What can be sweeter than the Babe, what more lovely than the mother! What fairer than her youth! What more gracious than her virginity! Look at the Child, knowing nothing. Yet all that is belongs to him, that your conscience should not fear but take comfort in him. Doubt nothing. Watch him springing in the lap of the maiden. Laugh with him. Look upon this Lord of Peace and your spirit will be at peace. See how God invites you in many ways. He places before you a Babe with whom you may take refuge. You cannot fear him, for nothing is more appealing to man than a babe. Are you affrighted? Then come to him, lying in the lap of the fairest and sweetest maid. You will see how great is the divine goodness, which seeks above all else that you should not despair. Trust him! Trust him! 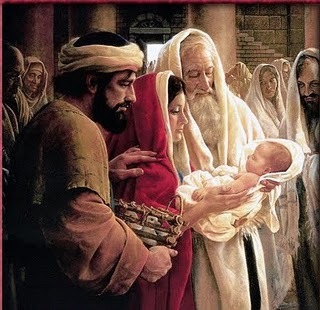 Here is the Child in whom is salvation. To me there is no greater consolation given to mankind than this, that Christ became man, a child, a babe, playing in the lap and at the breasts of his most gracious mother. Who is there whom this sight would not comfort? Now is overcome the power of sin, death, hell, conscience, and guilt, if you come to this gurgling Babe and believe that he is come, not to judge you, but to save.